InvictaDynamos | Czech hotshot Adam Rehak is back! Defences across the NIHL South are getting ready to feel the heat once again as the Invicta Dynamos today confirmed the return of league all-star, club forward of the year and 2016/17 playoff champion Adam Rehak who returns to the Mos for a second straight season. 24 year old Czech forward Adam Rehak arrived in Gillingham in the summer of 2016 with an exciting hockey CV having played in his home nation, in America, France and in Poland’s top tier. 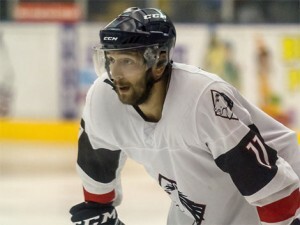 With appearances across Europe in his background he needed no time to settle in Kent and marked his opening trio of outings for the Mos with an assist on the road in Chelmsford, two goals and three assists at home to Bracknell and a further two goals and an assist at the SilverBlades against London. Having hit the ground running, Rehak then remained a force throughout the season as NIHL defences struggled to deal with his blistering pace, lightning hands and dogged determination. He would feature 45 times during 2016/17, racking up a remarkable 54 goals and 40 assists for a total points haul of 94 – an average of over two per game. Not one to be pushed around, the feisty forward also notched 96 minutes of penalties as he ditched the gloves to take on those whose only hope at stopping him meant fracturing the rule book. Adam Rehak’s performances unsurprisingly captured the attention of the league and come the close of the campaign he was voted into the prohockeynews.com NIHL South Division 1 All-Star team by his peers. The forward, who notched 6 hat-tricks during the season and managed 4 or more points a game 11 times in 2016/17, was also the worthy winner of the Invicta Dynamos ‘Forward of the Year’ accolade come presentation evening as the curtain fell on another term of Kent hockey. Now the Czech talisman returns looking to make his mark once more as the Mos get ready to compete in what is now British ice hockey’s second tier. Speaking on the return of Adam Rehak, Head Coach Kevin Parrish said, “Anyone who saw him last season knows what Adam brings to this league so I’m absolutely delighted to have him back for 2017/18. Adam arrived with an impressive CV but even then we didn’t know the gem we’d secured until he started running rings around teams on a weekly basis. He’s a goal machine who scores great team goals and fantastic solo efforts but the amount of assists he racked up last year shows he’s also a real team player. On the ice he plays with an edge and has that hunger to win – off of the ice he’s a pleasure to work with, doesn’t demand attention and keeps himself to himself. I know the fans took to him instantly when he first pulled on a Mos jersey a year ago and I’ve no doubt they too are delighted he has committed his future to Kent for another campaign”. 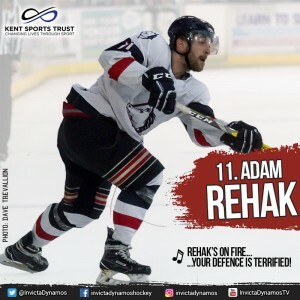 Adam Rehak will wear number 11 for the Invicta Dynamos again in 2017/18 and his return completes the club’s import pairing with fellow all-star Ondrej Zosiak also returning. News of further players to sign for the club ahead of the new season in September will continue to be revealed over the coming weeks. Warm-up Jersey – For just £125 get your name or logo printed on the back of Adam Rehak’s warm-up jersey. Sponsors are also named on our website and in our match day programme and then presented with the jersey to keep at the end of the season. Game jerseys – For just £150 get your name or logo printed on the back of Adam Rehak’s home or away game jersey. Want both? For just £250 for individuals / £300 for businesses get your name or logo on the back of each of Adam Rehak’s game jerseys. Sponsors are also named on our website and in our match day programme, are announced over the loudspeaker during player introductions at every home game, receive a programme advert (business sponsors only) and are presented with their jersey (one shirt) at the end of the season.